Former WBA/WBC light middleweight champion Saul “Canelo” Alvarez (44-1-1, 31 KOs) looked competitive during his bout with Erislandy Lara at the MGM Grand in Las Vegas, Nevada. So much that he was awarded a 12 round controversial split decision over the Cuban champion in their catch-weight fight at 155 pounds, and solidifying himself as the best fighter at Jr. Welterweight. After dealing with what most consider his “toughest opponent”, Alvarez is already seeking his next opponent. The majority of the boxing world is clamoring for a super fight with Middleweight Champion Miguel Cotto. However, if things don’t work out they way we want them to, several options are available for the young red headed star. This April, the Grand Master, Joshua Clottey made his return to boxing by scoring a 12 round Unanimous Decision over Australian veteran Anthony Mundine. In this fight, Clottey controlled distance well, maintained his impeccable defence, and managed to land power shots accurately, resulting in Clottey dropping the former champion to the canvas 5 times throughout the fight. This matchup hasn’t been mentioned much between boxing fans, but will most certainly show us several aspects from both fighters. 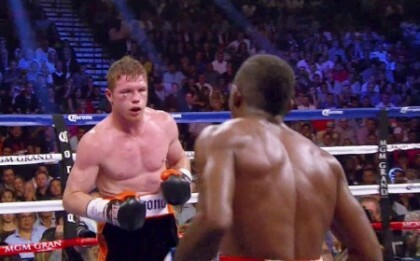 Whether or not Canelo can stick and move for 12 rounds, or whether Clottey can draw the Mexican superstar out of his comfort zone and bring him into a firefight. Joshua Clottey brings a recognizable name, veteran skills, and the possibility for fireworks in this style clash. Canelo Alvarez has several options ahead of him, including possible bouts with Peter Quillin and Miguel Cotto, and nobody can be overlooked. One thing is for certain, the fire just started burning brighter for this young superstar.